The sacrum is a wedge shaped bone that makes up part of the pelvis. It transmits the weight of the body to the pelvic girdle. As the name suggests, sacral insufficiency fractures occur when the quality of the sacral bone has become insufficient to handle the stress of weight bearing. The bone has lost some of its supporting structure and has become weak. Since this is usually because of osteoporosis, sacral insufficiency fractures occur most often in older women. What makes up the sacrum? The sacrum is the triangular bone just below the lumbar spine. The sacrum has five segments fused together into one large bone. The coccyx or tailbone attaches to the bottom of the sacrum. The sacrum forms the base of the spine and the center of the pelvis. The sacrum transmits the weight of the body to the pelvic girdle. It is shorter and wider in the female than in the male. Its name means sacred bone. 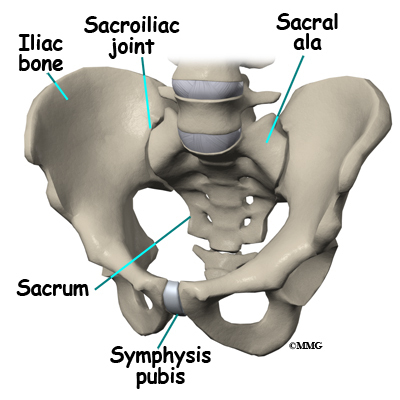 At the top of the sacrum there are wings from each side called the sacral ala. At the ala, the sacrum fits between the two halves of the pelvis. These pelvic bones are called the iliac bones. This is where the sacroiliac joints are formed. Most everyone has two dimples in their low back where the sacroiliac joints form. These three bones of the pelvis, the sacrum and the two iliac bones, make a ring. Each of the iliac bones has projections called the pubic rami. They meet together in the front of the pelvis, forming a joint called the symphysis pubis. The iliac bones also contain the cup or socket for the hip joint. Nerves that leave the spine in the area of the sacrum help control the bowels and bladder and provide sensation to the crotch area. There are three types of bone, woven bone, cortical bone, and cancellous bone. In adults, woven bone is found where there is a broken bone that is healing (callus formation). It can also be found with hyperparathyroidism and Paget's disease. It is composed of randomly arranged collagen strands. It is normally remodeled by the body and replaced with cortical or cancellous bone. 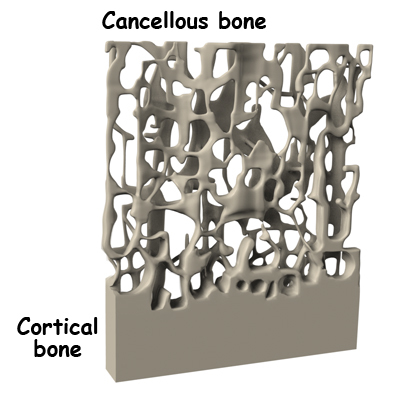 Cortical bone is called compact or lamellar bone. It forms the inside and outside tables of flat bones and the outside surfaces of long bones. It is dense and makes up 80 percent of our bone mass. The radius (wrist bone), skull, and long bones are made of cortical bone. Cancellous bone is also called trabecular bone. It lies between the cortical bone surfaces. It is the inner supporting structure and is spongy. It makes up 20 percent of our bone mass. Normal cancellous bone is always undergoing remodeling on the inside surfaces of bone. Cancellous bone is found in the hip, spine, and femur. The three main cells that form and shape bones are osteoblasts, osteocytes, and osteoclasts. Osteoblasts are bone-forming cells. When calcium is deposited in the cells, they make bones strong and hard. Osteocytes are mature osteoblasts trapped within the bone. Osteoclasts are bone-resorbing cells. They dissolve bone surfaces by releasing a chemical called an enzyme. Their activity is in part controlled by hormones in the body. It is normal for bones to have mini fractures from everyday wear and tear. They are healed by ongoing bone remodeling. Bone remodeling occurs in 120 day cycles. Normal bone has a balance of clearing away old bone and formation of new bone. Osteoclasts resorb or clear away the damaged bone for the first 20 days. Bone is then formed by osteoblasts over the last 100 days. Sacral insufficiency fractures usually are parallel to the spine. They are most often in the ala, just beside the sacroiliac joint. At times there is also a transverse fracture that connects insufficiency fractures when they occur on both sides of the sacrum. The fracture lines then create an "H" pattern. 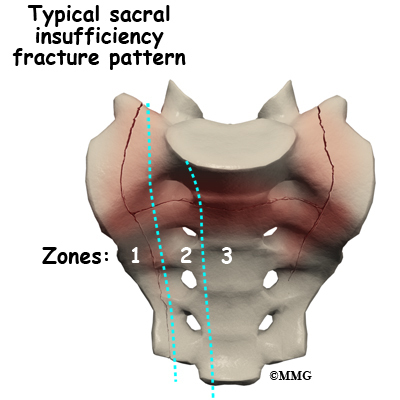 Sacral fractures are classified into three zones, zone 1, zone 2, and zone 3. If the fracture involves just the ala, there is usually not a risk for nerve damage. 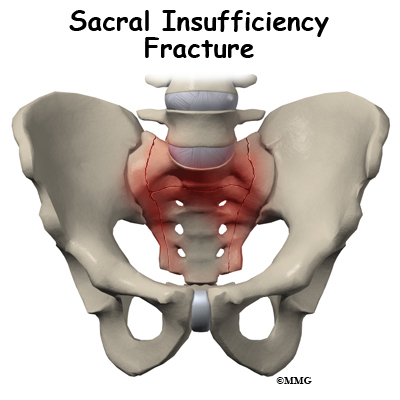 What causes sacral insufficiency fractures ? A physician named Lourie first described sacral insufficiency fractures in 1982. These fractures can cause severe pain in the buttock, back, hip, groin, and/or pelvis. Walking is typically slow and painful. Many daily activities become painful, difficult, and in some cases impossible. Sacral insufficiency fractures occur when the quality of the sacral bone has become insufficient to handle the stress of weight bearing. The bone has lost some of its supporting structure and has become weak. Osteoporosis is the leading cause of sacral insufficiency fractures. 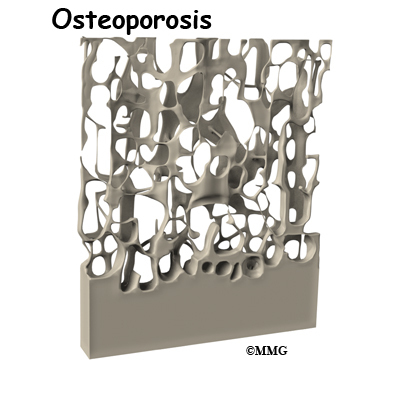 Osteoporosis is defined as low bone mass (weight). There is a decrease in bone tissue and minerals such as calcium. This can make the bones fragile. This means they can break more easily. Bone mineral density is measured by a DEXA scan. DEXA involves scanning the lumbar spine, the hip, and sometimes, the wrist. Osteoporosis affects 25 million people in the United States. Of these, 80 percent are females. Other risk factors that can weaken bone include radiation to the pelvis, steroid use, rheumatoid arthritis, hyperparathyroidism, anorexia nervosa, liver transplantation, osteopenia, Paget's disease, hip joint replacement, and lumbosacral fusion. Sacral insufficiency fractures can also occur in pregnant or breastfeeding women due to temporary osteoporosis. Sacral insufficiency fractures can occur spontaneously, meaning there does not need to be any trauma such as a fall. The fracture can just simply happen when the bone becomes too weak to handle the stress of weight bearing. When the sacrum is fractured, 60 percent of the time the bone in front of the pelvis will also fracture. This bone is called the pubic ramus. What does a sacral insufficiency fracture feel like ? 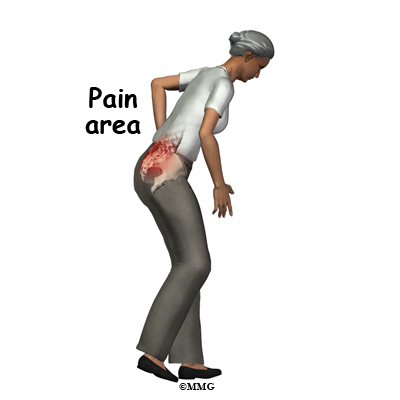 Symptoms can include severe pain in the buttock, back, hip, groin, and/or pelvis. 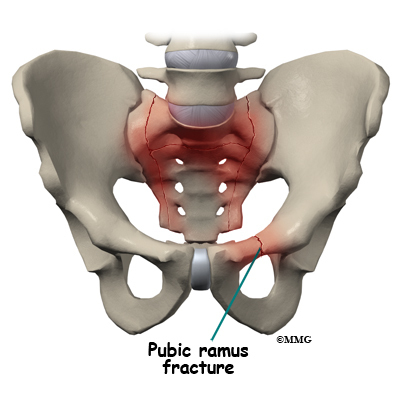 If the pubic ramus has fractured, there may be pain in the front of the pelvis. Walking is typically slow and painful. It can be difficult to do other necessary activities. Your back or pelvis may be tender to touch. You may find that you have limited range of motion of your low back. Rarely there is nerve damage with sacral insufficiency fractures. When nerve damage does occur, the symptoms are usually problems with bowel or bladder function, or decreased sensation or strength of the leg(s). Your doctor will want to ask questions about your general health, what your symptoms feel like, and if there was any trauma that could have caused your symptoms. Your doctor will want to perform a physical exam. This will likely include checking your nerve and spinal cord function, checking your range of motion, and feeling or tapping your back and pelvis to check for tenderness. Your doctor will want you to have imaging of your pelvis. Plain X-rays are often negative. However, a fracture will be seen on bone scan, Computed Tomography (CT), or Magnetic Resonance Imaging (MRI). Your doctor may order a bone scan with technetium-99m medronate ethylene diphosphonate (MDP). The MDP is injected into your vein. This should be performed after a minimum of 48 to 72 hours after symptoms begin. Where there is a fracture, the MDP will be concentrated. 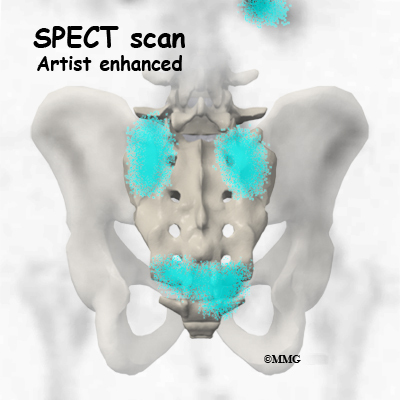 Uptake patterns on the scan may include the "H"-shape, also called the Honda sign when there is a sacral insufficiency fracture. Single Photon Emission Computed Tomography (SPECT) is a new, advanced diagnostic nuclear medicine procedure that uses the emission of a radioisotope that is carried in the blood to the tissues. SPECT imaging is often added to provide information that is not available on routine bone scan images. It provides three-dimensional (3-D) views of the area examined. Following a bone scan you will remain on the exam table and the camera will rotate around the table while it takes pictures. SPECT imaging adds 30 to 60 minutes to the time of the nuclear scan. Sedation may be needed. CT scan may be used to confirm and complement a positive bone scan. The CT scan uses special Xrays. MRI is the radiological examination of choice by some doctors. Bone marrow edema on an MRI suggests a fracture. The MRI machine uses magnetic waves, not X-rays to show the bone and soft tissues. Your doctor may request that you give samples of blood for the laboratory. This is to see if there could be another cause for osteoporosis that can be treated. Most of the time treatment for sacral insufficiency fractures is non-surgical. Treatment consists of rest, pain medications, and gradual walking with a walker or crutches. Improvement of symptoms may begin after one to two weeks of treatment. Most people are pain free in six to 12 months. Complete healing may occur after nine months. Most patients should have a full recovery. Water exercise may be recommended to allow movement. Bracing with a corset is sometimes helpful. Medications that are used to help the fracture heal include calcium (1200-1500mg) and Vitamin D (400-800 IU). Bisphoshonates such as Actonel, Fosamax and Boniva are used to treat osteoporosis. Calcitonin is also used to help with pain and healing of the bone when broken. Parathyroid hormone (PTH) replacement can also be beneficial. It increases both bone resorption and bone formation. Bone mineral density is increased, making the bone stronger. For pain, narcotics or opioids can be helpful. Some doctors feel that nonsteroidal anti-inflammatories (NSAID) such as Aleve or Ibuprofen should not be used for at least three to four weeks after a new fracture. Some studies have shown that they can slow fracture healing. Your doctor may want you to have physical therapy to help with your pain. Heat, gentle massage, and electrical stimulation, or TENS units may improve pain. Surgical treatment is rare with sacral insufficiency fractures. A newer treatment that shows some promise in relieving pain and allowing more normal activity sooner is called a sacroplasty. 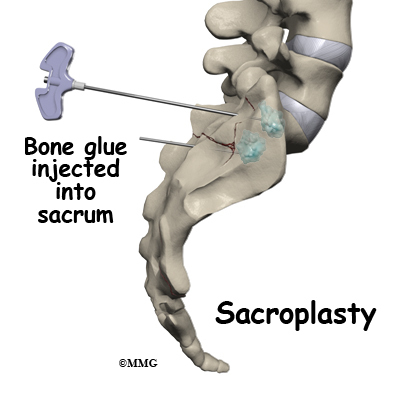 During sacroplasty, a bone glue called polymethylmethacrylate (PMMA) is injected into the fracture. Serious complications can occur if it is not performed correctly. Sacroplasty may be considered in those with a severe decrease in functional ability and quality of life. It may provide faster relief of pain than typical conservative care. It is usually done in a surgery suite. The area that is to be injected is cleaned and sterilized. This helps to decrease the possibility of an infection. A needle is placed in the area over the fracture. This is monitored with an X-ray machine. Bone glue is then injected and hardens rather quickly. This stabilizes the fracture. You are usually allowed to go home the same day. If there are neurological symptoms from the sacral fracture, The sacrum may need to be stabilized. Hardware such as screws and plates may be used. Previously, bedrest was the recommended treatment for sacral insufficiency fractures. There are many complications of prolonged bedrest, especially in the elderly. Medical management presently allows limited weight bearing. This can be tolerated with a wheeled walker or crutches in most cases. Limited weight bearing actually helps to stimulate new bone growth. In six to nine months, you should be able to return to your previous activity level. If you have sacroplasty, the fracture will be considered healed much more quickly. This allows you to return to your previous activity level sooner also. Your doctor will likely repeat imaging studies to check the progress of the healing fracture(s). Treating osteoporosis is crucial in an attempt to decrease the risk of another insufficiency fracture. Your doctor will likely recommend additional calcium, vitamin D. A prescription medication to help prevent mineral loss from your bones is also commonly used. Regular follow up with your doctor is important. DEXA scans are usually repeated to ensure that the treatments for your osteoporosis are working. Weight bearing activities such as walking, and lifting light weights can be helpful. Avoiding excessive caffeine, alcohol, and smoking is important. You will likely have to remain non-weight bearing for a period of time before being allowed to walk with a walker or crutches. You will need assistance for daily activities initially. This may mean that you will have to have live-in help, or stay in an extended care facility or nursing home. Once allowed, your surgeon may want a physical therapist to help with walking and maintaining strength. Your surgeon may want an occupational therapist to help you with equipment that may be helpful, showering, dressing, and other daily activities. Your surgeon will want you to follow up with him or her on a regular basis to check on how the fracture is healing. Imaging studies will be repeated. Healing should occur in six to 12 months. If the fracture heals properly, you should be able to return to your usual activities. Treating osteoporosis is crucial in an attempt to decrease the risk of another insufficiency fracture. Your surgeon will likely recommend additional calcium, vitamin D. A prescription medication to help prevent mineral loss from your bones is also commonly used. Regular follow up with your doctor is important. DEXA scans are usually repeated to ensure that the treatments for your osteoporosis are working. When allowed, weight bearing activities such as walking, and lifting light weights can help keep your bones strong. Avoiding too much caffeine, alcohol, and smoking is important.